Chicken and Dressing Casserole | Yummytums! Posted at 10:10 am by Yummytums! Before you dive into your Thanksgiving Day turkey and dressing, give this variation a trial run. It’s a great cold-weather dish, made healthier by the addition of extra vegetables. And don’t be tempted to use the “cream of whatever” canned soups. You can quickly and easily make your own soup base for this dish, minus the preservatives. A side benefit is that this same base can be used to create a quick dinnertime soup. You probably already have everything you need in your pantry. Add 1 TBSP canola oil to a large saucepan over medium heat. Slowly stir in the flour to make a rue. Add the milk and the chicken bullion cube and continue to heat, stirring constantly, until the mixture begins to thicken and the bullion cube has dissolved. Add the salt, pepper and garlic powder and stir. (If you wanted to use this as a stand-alone soup, you could add chopped cooked chicken and/or mushrooms.) Transfer the soup to a bowl and set aside. 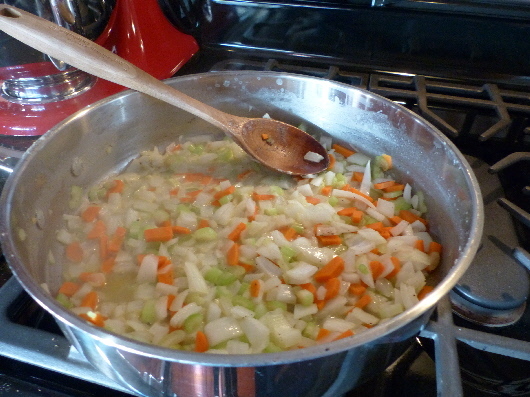 Add 1/4 cup of the chicken stock into the saucepan, along with the diced carrot, onion and celery. Sauté until the vegetables are softened and most of the liquid has absorbed. Transfer the vegetables to a plate and set aside. To make the stuffing, add 1/2 stick butter and the remaining 3/4 cup chicken broth to the sauce pan and heat until the butter is melted. Place 1/2 of the package of stuffing mix into a large bowl and pour the broth and butter over the stuffing, stirring well. Add the sautéed vegetables, diced apple and soup, stir. Add more bread crumbs if the mixture seems too wet. Set aside. Place the remaining 1 TBSP canola oil to the saucepan and cook the chicken until it’s cooked through and no longer pink. Add the cooked chicken to the stuffing, stir, and spoon it into a greased 9 x 13 inch casserole dish. Bake at 350 degrees for approximately 35-40 minutes.